Assistant Minister for Local Government, Housing and Environment Lorna Eden says waste management is a significant management process that is critical in any municipality. 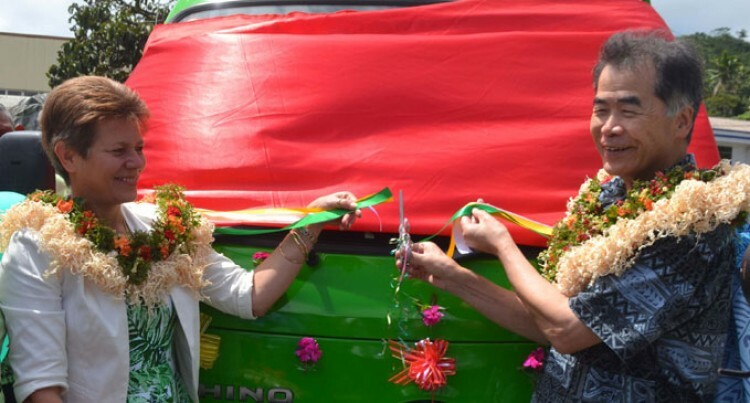 Mrs Eden made the comment while receiving a new garbage truck on behalf of Savusavu Town Council from Japanese Ambassador Takuji Hanatani in Savusavu yesterday. The new five-tonne garbage compactor truck is worth $175,900. Mrs Eden said the use of the garbage compactor trucks was an internationally accepted best practice in solid waste management. “This donation would greatly assist in the overall waste management strategy of our nation,” Mrs Eden said. “The handing over this truck demonstrates that the council is seriously focusing on its service delivery to its population. She said it also reaffirmed the commitment of the government of Japan to assist small islands likes ours. Mrs Eden acknowledged the foresight and planning of the special administrator of Savusavu/Labasa, Vijay Chand, and his team in investing ratepayers fund in the area of waste management. “The for the Ministry responsible, it is my desire and ministry’s expectation to see our towns including Savusavu to embark on many more innovative ideas so that ratepayers are better served,” Mrs Eden said. Meanwhile, Ambassador Hanatani said the truck had greater loading capacity than ordinary trucks and as a result of its compacting ability there was minimal spillage of waste during transportation. “I hope with proper maintenance and care this truck would continue to serve Savusavu community for many years and help Savusavu shine, just like its world famous pearls,” Mr Hanatani said.